A suspected ritualist, Taofik Adara, a.k.a Kie-Kie, arrested in Badagry on Sunday with human parts yesterday said he was paid N4000 to butcher the victim. The suspect, who was paraded by the Lagos State Commissioner of Police, Fatai Owoseni, at the command headquarters, Ikeja, yesterday admitted chopping off the victim’s head with a cutlass, while two clerics (alfas) and an herbalist held onto her hands. Adara said the cutlass used was given to him by the herbalist who contracted him for the job. According to him, the victim, whose identity was still unknown till yesterday afternoon, was brought to him from Sango Ota, Ogun State. “I live at the Itoga-Zeba area of Badagry. I am a wood cutter and at times I assist owners of coconut plantations to pluck coconut. The whole drama started on Saturday evening when one of my herbalist friend known as Manase came to me to say that he was expecting two alfas from Sango Ota. He told me they would be coming with a lady and that he would pay me N4000 to help butcher the woman. He told me the two needed some fresh human parts to prepare a concoction for one of their clients. 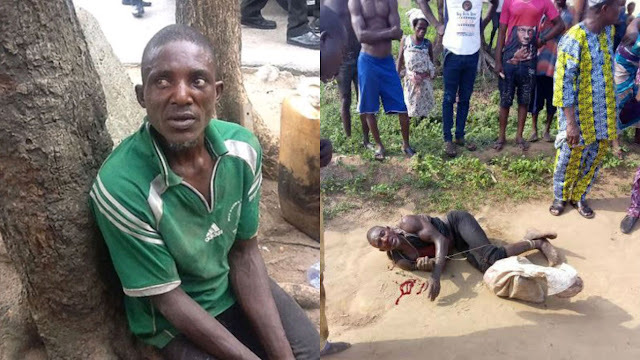 The 61-year-old ritualist, who admitted that he had killed one other person about a year ago, disclosed that his herbalist friend was the one who also brought that victim to him.